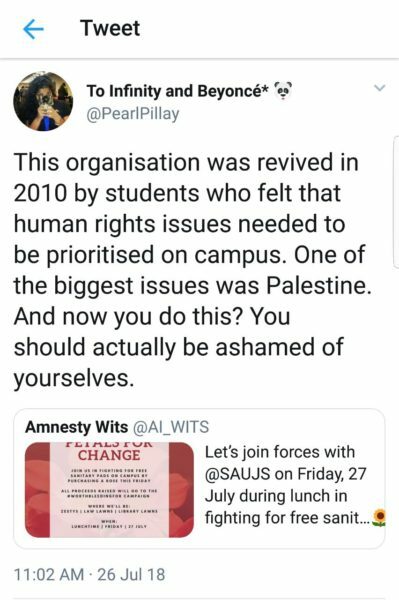 A collaboration between Amnesty Wits and the South African Union of Jewish Students has sparked controversy on Twitter. A campaign aimed at raising funds for free pads at Wits University is mired in controversy over the collaboration between Amnesty Wits and the South African Union of Jewish Students (SAUJS). The two organisations joined hands for the “Petals for Change” initiative at the university’s main campus on Friday, July 28, which involved selling fresh roses to raise funds for the #WorthBleedingFor campaign hosted by Amnesty Wits. Some Twitter users, including members of Amnesty Wits, bashed the collaboration with SAUJS, a pro-Israel organisation. Amnesty Wits has previously been critical of human right abuses in Israel including the treatment of teenaged Palestinian activist Ahed Tamimi at the hands of the Israeli state, who had been sentenced to eight months in prison after slapping an Israeli soldier. Azra Karim, Amnesty Wits member told Wits Vuvuzela, “All struggles are intersectional, hosting this campaign is like hosting a gender-based violence march with Mduduzi Manana,” she said referring to the controversial former African National Congress MP who was accused of gender-based violence (GBV). Amnesty Wits acting chair Haafizah Bhamjee said her organisation was approached by a member of SAUJS who conceptualised the campaign. “We [executive members] did a lot of deliberation before and made sure the event had nothing to do with Israel-Palestine”, Bhamjee said. A statement from Amnesty Wits in response to the criticism received from their own members and on Twitter, said that the collaboration was in line with their mandate as a non-religious, non-political organisation. “We are an organisation that strives for objectivity. This does not mean we are oblivious to political issues … we take stances based on our own analysis rather than partaking in political side-taking,” the statement added. Karim said that she wants to see greater consistency from Amnesty Wits. “How do you align yourself with people who support a blockade on Gaza that violates Palestinian women’s rights to dignity and access to sanitary products? Either be consistent or don’t do anything,” she asked, adding that she and other members were reviewing their membership of Amnesty Wits. FEATURED IMAGE: Members of SAUJS and Amnesty Wits sold roses as part of a controversial campaign to raise funds for free sanitary pads.